As academics, we tend to look at the summer with both anticipation and dread. Of course, we love the time away from the classroom, the time to (ostensibly) think, read, and write – as well as find various diversions of the non-academic variety. Indeed, it is those diversions that makes the summer also a minefield of regret. In general, I tend to be productive during the summer, though I often find myself letting hours, and days, and (far too often) weeks slip by without a manuscript anywhere near completion. Add the various service and committee duties that seem to colonize the summer, even for faculty like myself on nine-month contracts, and it is very easy to wake up one morning and realize that it’s mid-August and (at least here in the US) time to head back into the classroom for another round. In any event, as part of the navel-gazing class, I got thinking about the academic summer, and letting things slip, and the idea of productivity, and an existential “what does it all mean” thing that, in the quieter moments, we have the luxury to consider. This, at least for me, means a fair amount of daydreaming and reading of books which often have little to directly do with the day job. And, being middle-aged and rather comfortable at that, my daydreaming and reading often leads me to long for something approaching perfect, uncomplicated leisure. Peter O’Toole grew up in Leeds, and recalled sitting in packed pre-war cinemas cheering newsreel footage of Len Hutton’s 364 in 1938; Hutton became his first cricket idol. 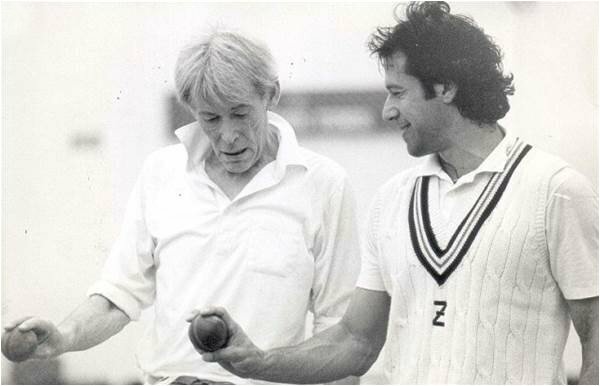 He would seize any opportunity to introduce cricket to film sets, improvising games with Omar Sharif in the desert while filming Lawrence of Arabia, and teaching the basics to Katharine Hepburn during the making of The Lion in Winter. He was frank about his own limitations as a batsman and off-spinner: “I have a delivery which is really, really special. It does absolutely nothing.” But, when he had a son at the age of 50, he took coaching qualifications. “The only thing I’ve ever been interested in teaching anyone in life is cricket,” he said in his final interview. Anyway, enough daydreaming for now. I must get back to the academic summer, lest I face an August of regret. By Gregory Ramshaw in Uncategorized on June 23, 2014 .